It gives the Deeper Spiritual Understanding of Truth and Idealism. Sodalite Stone has a strong vibration that will bring your attention to the qualities of idealism and truth. Its energy may stimulate you to live up to your own ideals and ideas, about the nature of truth. Its energy is particularly helpful to aid the development of psychic abilities, and with developing intuition. It is excellent to aid communication and may help you if you are doing public speaking. It may help you to understand the patterns behind such things as astrology and the tarot. Within the third eye chakra area is where the pineal gland is located. To assist with the development of psychic gifts, working within the third eye with Sodalite Stone has a strong ability to accelerate the process. This stone has a vibration that aids truth... and helps you to better understand the life you are living... and how you came to be in the situation in which you find yourself. Many people find it easier to avoid the truth... as it can sometimes be uncomfortable at certain times. This stone aids idealism and self-discipline, and the combination will benefit you to enhance your ability to live a more authentic life. Learn easy techniques for meditating, as this is an excellent stone to help you to go deeper into the meditative state. It is very helpful if you have found your meditation to be lacking depth, or if you have trouble focusing on what you hope or desire to achieve through the experience. It will help you to open and develop intuitive abilities. These gifts may aid you to make better use of spiritual information, that it helps you to bring through from your higher self during meditation. It assists you to access your own subconscious, and will help you to better understand yourself spiritually and may help you to recall your dreams and may aid lucid dreaming. It may stimulate latent abilities that you were unaware of having... including aiding you to develop your clairvoyant abilities. It it may help to enhance your creativity... and to develop your mental abilities, and use them in areas such as research. This may be within areas that you may not have previously thought about. It aids teachers, writers and students to understand deeper philosophical principles. If you work with a group... this stone is excellent to accentuate the groups purpose and to better cement the actions and aims of the group. It helps to being harmony, trust and strength of purpose to all of the group members. It stimulates a knowledge of desirable shared outcomes without a need for members to feel dependence on others in the group... in order for their aims to be achieved. Sodalite Stone is also is an excellent stone for communication... and this action is strong within the throat chakra. This stone helps you to think rationally and intuitively and to verbally communicate your thoughts both truthfully and in a calm and relaxed manner. 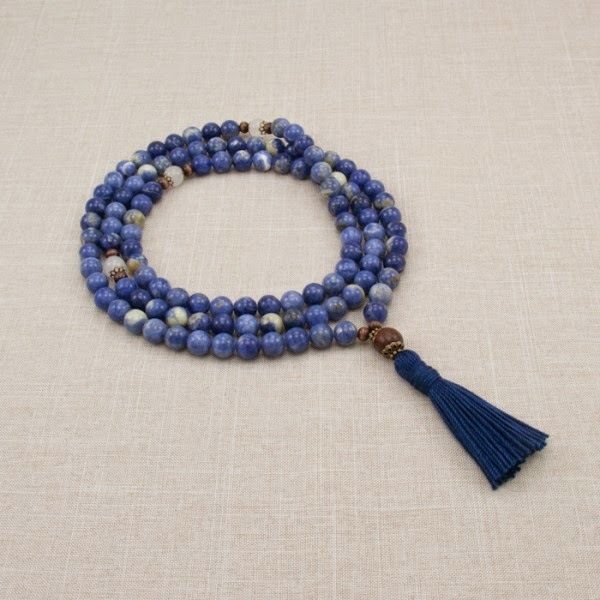 Sodalite stone has an excellent energy that will bring calmness to your emotions, and strong clarity to your thoughts. This stone helps to build your self esteem, and it calms any panic you may be feeling about talking in front of a group of any size. If you are a public speaker, and are prone to feel dismay or fear about speaking in front of crowds... as many people do... this stone's vibration may aid you to contribute in a more balanced way. If you do start to feel a panic attack coming on, it will quell your panic and help you to feel calmer... and think clearly through the episode. Sodalite's energy helps to quieten your emotions, and it encourages you to release old programming about specific issues that may be concerning you.